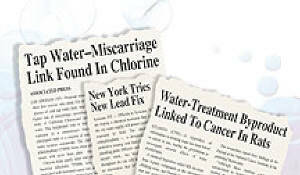 © 2007 - Air Rehab Corp. - All rights reserved. 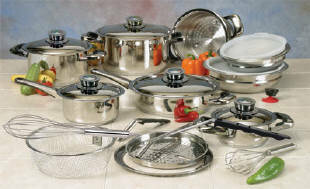 Worlds Finest - Nutri Stahl 24 element 22pc Surgical Stainless Steel Waterless Cookware Set. Each piece is constructed of extra heavy surgical stainless steel and guaranteed to last a lifetime. The 24 element construction spreads the heat quickly and evenly. The Temp Control Meter makes "waterless" cooking easy and more healthy because it eliminates the need for water, grease or oil in cooking. To use the Temp Control Meter start cooking on medium heat (never use high heat). Then when the meter enters the Green Zone turn the heat down to low and finish cooking. The food is cooked in its own juices and retains the vitamins and minerals and the FLAVOR! The food comes out tender, moist, flavorful and incredible! The 24 element construction allows you to stack cook with this cookware. Begin cooking on individual burners and when the meters are green you can stack the pans to finish cooking. The set consists of: 3 Quart Saucepot with cover, 6 Quart Stockpot with cover, Large Mixing Bowl, Medium Mixing Bowl, Mediaum Steamer, Adapter Ring, Grater/Utility Rack, Steamer Basket, Steamer Basket Handle, Whisk, Suction Knob, Utility Rack Handle. Comes with a Limited lifetime warranty. Before you invest over $2000 in a set of 7ply cookware consider our advantages and superior features. Gift boxed 37 lbs. The 4 Most Impressive Products We've Ever Seen! 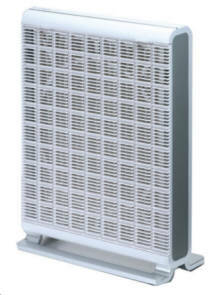 Filtersteam AirTamer A710 Ultra High Efficiency Air Purifier comes with an ultra high performance pleated filter. Even with six fans, this quiet air purifier uses only 5W of power - that's less than the typical night light! 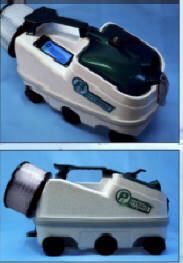 Effective at capturing dust, pollen, mold spores, dust mite debris. Aroma cartridges condition air with healthy scented air. Three aroma cartridges included. Automatic on/off timer starts or stops the Filterstream AirTamer in 2-, 4-, 6-, 8- or 12-hour intervals. Whisper quiet commercial-quality fans deliver quiet bedroom operation. 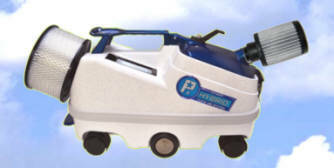 Designed to operate continuously 24 hrs per day for slow, constant air cleaning. NON HEPA filtration designed to operate 24 hours per day for slow, quiet, constant dust removal.